Anyone Build A Tube Bender? 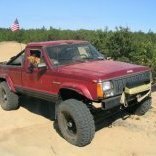 I am looking at putting a roll cage in my Suzuki buggy project and eventually putting one in my 92 MJ. What I've found is that prebuilt cages are expensive and don't fit well, it's expensive to pay someone to build you a cage, and buying a tube bender and dies is stupid expensive. I have been thinking about this off and on for a few months and have finally decided it will be best for me to try and build my own bender from scratch since I don't have the money for the other options. 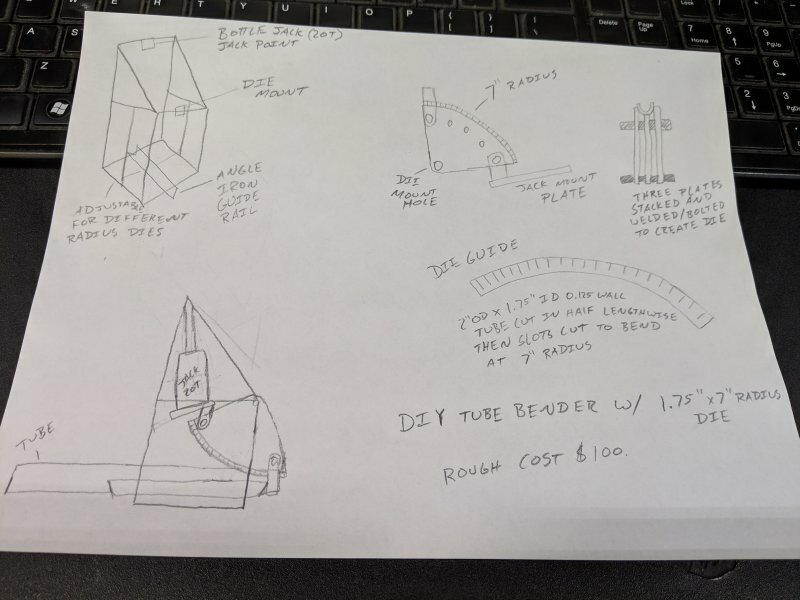 After looking at many ways people have gone about this, I have put together some good aspects from a couple builds I came across, to create a design that will bend up to 90* and as long of a tube as will fit in my shop, that is dirt cheap. It will use a 20 Ton bottle jack from Harbor Freight and I will build a 1.75" die with a 7" radius out of 2" OD x 1.75" ID tube and some steel plates. Using some steel scraps I've got laying around, I'm guessing it will cost around $100-$150 for the bender and die. Anyone ever do something like this before or have any input on the design? Like I mentioned in the first post, I've spent months looking into this and pulling the best aspects from other people's diy designs. I'm looking for first hand experience and advice on bending and benders, not help using the Google search bar. No need to reivent to wheel. You're going to find that trial and error is going to put you out a lot more cash and time then going with something that others have already done. Yeah you can do it on the cheap but really if you have a crappy die your bends will look like $#!&amp; and not do what you need. I'd go with a gottrikes plan for a bender. Once I get moved its the route I'll be going. I do like this design and it was one of the contenders. I'm just torn between how much I'll use it and cost. They do have good prices on dies though so I may look into this more. everything I've read says the dies are key. quality is worth it. I get it. It becomes one of those tools that you kind of need once and then that's it. Realistically you could probably sell it after your done and at the least break even on parts cost. More than likely pocket a few bucks. That's a good point, I'm sure it wouldn't be hard to sell. I went 1/2's with a buddy on a bender and dies. I couldn't really justify the full price on my own in the beginning but, now wish I would have bought a nicer one because it has gotten quite a bit of use over the years. I have a pro tools hydraulic with 1.75" and 6" radius dies. You WILL get tired of pumping that Jack! I have a feeling that this is one of those tools that once you have it, you will find more and more excuses to use it. And so will friends and family!